I recently got my Ultimaker 3 Extended and already printed some things successfully but I´m still tweaking settings. 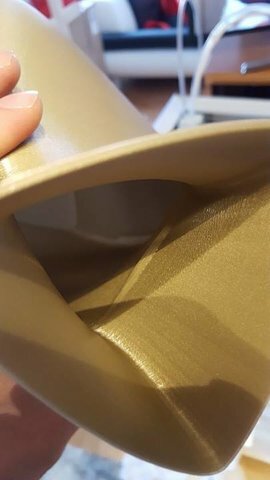 The last print was a 29cm high Vase with 0,4mm nozzle, 0,3mm layer height, 70mm/s printspeed, outerwall speed 35, inner 50mm/s at 205°C with Colorfabb pale gold in Cura 2.4. There were 5 layers of wallthickness. 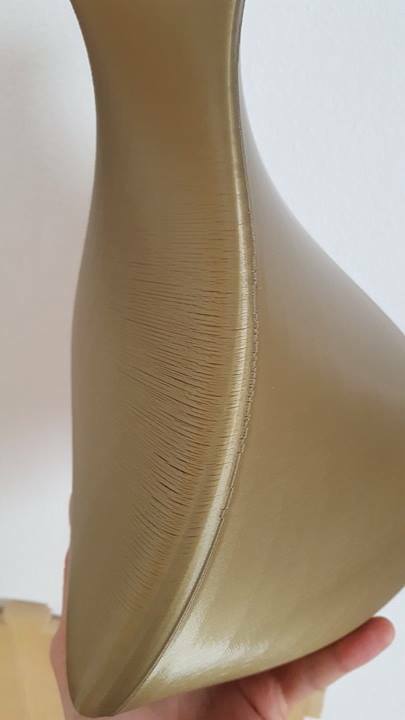 I´m got 1 year of experience with 3d printing cause of my FFCP, but havn´t seen errors like this before. As you can see in the pictures below, the layers delaminated completly from the lower ones. This behavior startet at about 12cm height, and ended on 21cm and only occured on that corner (it pointed towards the back of the UM3). The Inside of the vase is even more chaotic. The layers are just "strings" and not connected at all. Besides the file obviously having some errors (see that "scar" right besides the delamination? Seems thats the start and ending point of the layers. In Simplify3D those are not even connected and shown as a 1-2mm gap) it seems for me that towards the end of the layer the printer does something to the filament flow or anything like that - As I´m not really used to Cura I can´t really tell what setting could cause this error. Does anyone of you guys have a clue how to solve this? It seems like the layers are warping inwards and cause of this the following layers are printed without contact to the previous one --> I´m just pulling strings that way. I made a testprint with 1 layer of wallthickness were after already about 3cm height the nozzle was about 5mm shifted from the previous layer. Lowering the thickness from 0,3mm to 0,2mm solved that.